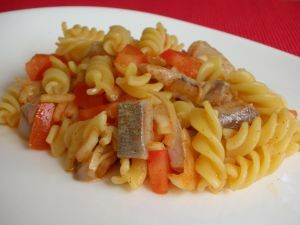 Herring in Otet | Herring in Vinegar is a Romanian food recipe cooked in vinegar with carrots and onions. Clean one herring, and cut it into larger pieces. Bring to a boil vinegar, then add one carrot and one onion (both sliced crosswise), one or two laurel leaves, a few grains of pepper, a little mustard (use grains if possible) and a little thyme. Now add the herring pieces, together with ½ cup of olive oil and continue to boil for 1 to 2 minutes. Serve cold mixed with noodles.